We're starting to see more of a shift from "cha-ching" to "bleep-bloop." Digital wallets provided by services such as Apple or Samsung Pay, Venmo, and Paypal are a relatively new invention in the world of personal finance. Cash is still a major means of conducting transactions in many cases. For the Swedish though, cash may soon become a relic. In Sweden, people are abandoning the use of paper money for an increasing number of everyday transactions. In fact, the amount of hard cash (and coin) in circulation has decreased by 40 percent in the last 7 years. This abandonment is due to several factors, among these is the prevalence of cards, both debit and credit. 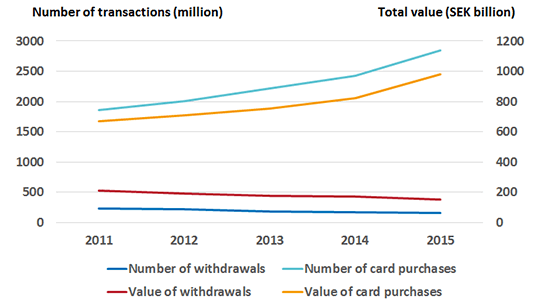 According to the Riksbank, Sweden’s Central Bank, the number of cash withdrawals are steadily decreasing while the number of credit card transactions are increasing. A study conducted by Sweden’s KTH Royal Institute of Technology shows how there is less than 80 billion Swedish crowns (krona) in circulation; a decrease from SEK106 billion six years ago. The study cites Sweden’s strong IT infrastructure which leads to more adoption of payment apps like Swish and the digitization of some Swedish Banks. It might be easy for Sweden now but having other countries shun physical money could still be a challenge. “Swish is a brilliant idea, but to introduce it internationally is a challenge, not least because it takes a long time to change other countries’ banking systems from scratch,” says Niklas Arvidsson, a researcher in industrial economics and management at KTH. Several countries are already considering this shift. India’s Prime Minister Narendra Modi for example is pushing for a ‘less-cash society’ to pave the way for a cashless society in the future. More of India’s population have cell phone subscriptions than nearly every other country, which could make it possible for app-based payment systems to flourish in the country. Indeed, Paytm, India’s largest mobile payment company has told BBC news that it has experienced an increase of users with transactions numbering around 5 million. Adoptions in other countries are still some ways from fruition however, as people still worry about the implications of a cashless society especially when people are still used to dealing with cash.